When I was first approached by Kyle to give Crossfit a try, I was petrified. I knew nothing about it except horror stories from friends who vomitted and/or passed out mid-workout. I am not the most athletic or coordinated person out there. I have not touched a dumbbell in 10 years albeit the odd occasion I spring clean and have to rearrange the closet where we keep our old and dusty exercise equipment. My last effort to get healthy was a short zumba stint with the Playstation in front of our tv. Now you can understand why I was a bit apprehensive. I was so scared that I put it off for an entire month. The only reason why I decided to finally give it a try was because I had nothing to lose and everything to gain. Number 1: It was free. I could quit anytime and not lose any money. 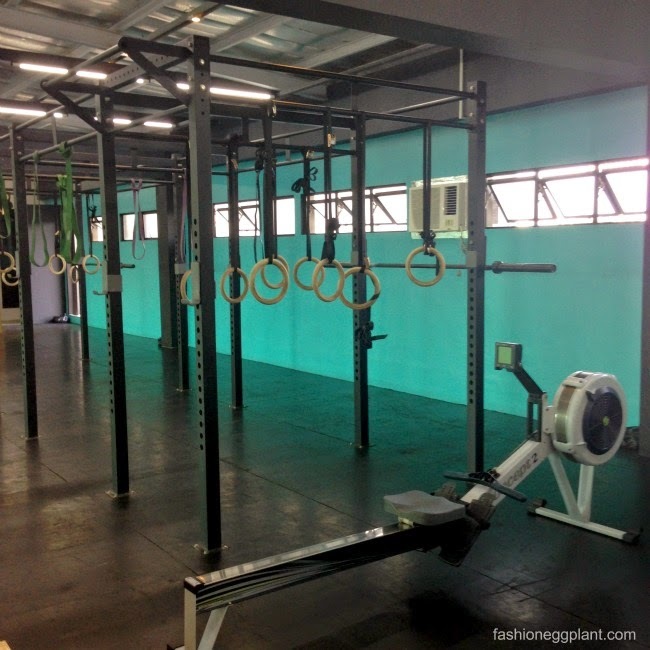 Number 2: Crossfit Greenhills is located at a very short proximity from my place. I can walk to class easily. Number 3: After 8 years, I think it's about time I finally get rid of my pregnancy pouch. I am not here to convince you to jump right in and enroll in a class. Anybody can do Crossfit but admittedly, Crossfit is not for everyone. I am simply here to share my experience with you and maybe encourage you to do a free trial and see for yourself wether or not it is the right workout routine for you. First up, what is Crossfit? Crossfit is a combination of high-intensity interval training, olympic weightlifting, plyometrics, powerlifting, gymnastics, girevoy sport, calisthenics, strongman exercises and other exercises. The Box is what you call the gym you work out in and it is exactly that: a box. There are no sophisticated machines or flashy interiors. Just a box with free weights and this jungle-gym like contraption for doing pull-ups and stuff (which I forget what it's called). It all seems intimidating and military-ish but it actually isn't once you're there. It's very different from all the YouTube videos (which still intimidate me today) I've seen. You don't have to go full-on "Beast Mode". It is unlike regular membership gyms where there is a silent air of competitiveness lingering in the air and you can feel people judging you for your outfit and what you look like. You spend hours in solace battling with the elliptical or treadmill while watching reruns of The Simpsons (that's what I used to watch). You go home sweating and the only thing that keeps you returning to the gym is your fitspo or the desire to look good in your bikini for an upcoming beach trip. I have nothing against that or any other type of workout. It just didn't do it for me in the long run. What I have come to love about Crossfit is the sense of community and genuine concern you develop for one another. My box feels like a family. We all help each other build ourselves from the ground up. I also love how your focus automatically shifts inward once you start working out. You don't think at all about what you're wearing, what they're wearing, what they look like, how big their muscles are, how flat their tummies are or how much firmer their butts are. Your focus turns solely into being able to do your skills properly and your ability to finish harder, faster and better than last time. I have never felt stronger or healthier in my entire life. I can do things now that I never thought were possible before. My goals have changed from just losing my pregnancy pouch to being a stronger and healthier person and this is what makes me go back day after day. Crossfit makes me want to be a better version of myself both inside and out. There are free trial classes every Saturday at 2pm.